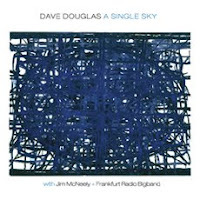 A Single Sky - Dave Douglas with Jim McNeely + Frankfurt Radio Big Band (Greenleaf Music) - Trumpeter/composer Dave Douglas is nothing if not prolific but, unlike some artists, his quality level is quite high. This CD, released in October 2009, is his first "big band" recording and it is quite impressive. 3 of the disk's 7 pieces are part of Douglas's "President's Suite", commissioned by NDR (North German Radio) and premiered at the Jazz Baltica Festival 2008. There is a grandeur and a heaviness to "The Presidents", the track that opens the program, the soloists striding over the fullness of the horns and the pounding percussion. "Campaign Trail" is a bluesy romp (a la Thad Jones/Mel Lewis Orchestra), bouncing along atop as rhythm not unlike what Shelley Manne played behind Sonny Rollins on "I'm An Old Cowhand" - the piece gets bluesier during the solos and, at times, feels like a train moving from tow to town with the candidate onn a "whistle stop tour." "Blockbuster" kicks up the intensity another notch or 3 with strong solos from Douglas and tenor saxophonist Tony Lakatos over a blazing, declamatory, horn arrangement from the composer. The other 4 tracks are older works by Douglas,, arranged for the big band by the WDR resident conductor Jim McNeely. He took these "small group" pieces and captured both the composer's melodic and emotional intentions. "Bury Me Standing" (from "Mountain Passages") is quite atmospheric, whisper-quiet at times, with a long, probing solo from trombonist Christian Jaksjö and a strong lead line from the composer. Other highlights include the fast-paced title track with a forceful brass arrangement and fiery drumming from Jean Paul Höchstädter. The pretty ballad "Tree and Shrub" (a piece from Douglas's Quintet week at Village Vanguard) features Douglas alongside fellow trumpeter Axel Schlosser. The silky sounds of trombonist Peter Feil are featured on "The Persistence of Memory", a piece from the 1990s which builds in intensity as Douglas builds his memorable solo. The rhythm section shines throughout (especially the drummer and pianist Peter Reiter) and there really is no weak link. The "section" parts are so well written and set off the solos dramatically. 2009 was a splendid year for large ensemble recordings and "A Single Sky" is no exception. The music is compelling, forceful and alive with possibilities, not unlike the political landscape the composer illustrates in his suite. For more information, go to www.greenleafmusic.com. 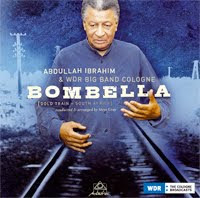 Bombella - Abdullah Ibrahim & WDR Big Band Cologne (Intuition) - One of my favorite large ensemble recordings is Ibrahim's 1980 "African Marketplace", one of the more evocative albums released. Ibrahim recorded the Lp with a (mostly) American lineup - to the best of my knowledge, there are few other examples of the pianist/composer in a "large band" setting. There is nothing confrontational about this music; instead, it swings, bounces, bubbles with positive emotions, and features impressive solo and ensemble work. The melodious arrangements come from the pen of British composer Steve Gray, who passed away 5 months after the recording. Ibrahim's songs come from his South African homeland, many have a bluesy, gospel, feel, rising and falling on the fine rhythm section of John Goldsby (bass), Hans Dekker (drums) and Paul Shigihara (guitar). Ibrahim opens the program with "Green Kalahari", a solo piano improvisation. He's featured on the lovely "Meditation", a contemplative solo piece that gives way to "Joan Capetown Flower (Emerald Bay)", a sweet ballad for Ibrahim and tenor saxophonist Olivier Peters. An interesting change of pace is the medley of Thelonious Monk's "I Mean You" and Ibrahim's "For Monk." The piece swings sweetly with strong solos from Shigihara, trumpeter John Marshall, and tenor saxophonist Paul Heller. Gray creates a whirling transitional section out of which the pianist takes the Monk melody and grafts it onto his piece, slowing the pace as the band reenters for Peter's splendid soprano sax solo. Karolina Strassmeyer's piccolo flute leads in "Mandela", a swing piece that could easily come from the fertile mind of Henry Mancini with an arrangement that blends the feel of South Africa with the Kansas City blues of Count Basie. Ibrahim's "For Lawrence Brown (Remembrance)" celebrates the fine trombone player from the Duke Ellington Orchestra; it's a ballad spotlight for Ludwig Nuss (trombone) and a short but ever-so-sweet piano interlude. Ibrahim's sliinky piano intro gives way to a slinky bass line, the pitter-patter sounds on the snare drum and slippery horn lines on "African River." Strassmeyer's exciting also sax work dances atop Dekker's "parade drum" accompaniment (sounds a bit New Orleans-influenced) as does the fine trumpet work of Rob Bruynen. Strassmeyer leads the reed section as they trade licks and spar with the brass sections. "Bombella" is a joyous celebration of the work of Abdullah Ibrahim, a composer/performer whose music is a cogent reminder how one can rise above the humiliation and injustice of their native land to create beauty. For more information, go to www.intuition-music.com.